So I have another circle lenses review! 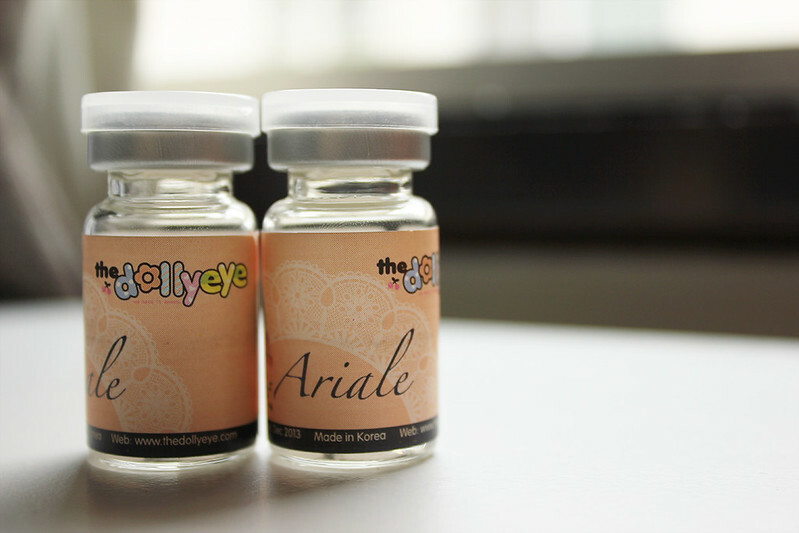 This time it is Ariale lenses from The Dolly Eye brand! This is my first time to try a different brand from GEO. I saw a similar one in the GEO catalogue however it didn't come prescripted so I opted for The Dolly Eye. Please note I have worn these lenses for about 2-3 weeks before reviewing. It's dark grey and has a "diamond" design on it. Close up, you can see the design well however from a distance, it is creates somewhat a halo effect on the eyes. This is my first pair of circle lenses from theDollyEye and they are quite comfortable! I feel almost as though the lenses are slightly thinner than GEO lenses but they were a breeze to put into my eyes. Like any other lenses, after a period of time my eyes do get dry and uncomfortable but not to the point of irritation. Being a 14.5mm lenses, it looks much bigger when worn! A brilliant grey color with a diamond design, theDollyEye Ariale lenses are one for attention. In my opinion, they DO NOT blend well with the natural eye but with a lens this design, that is to be expected. Best paired with bold or dramatic makeup to make your lenses stand out. I may not buy these again as I like to experiment with other designs but for a first time buyer of theDollyEye, I am pleased with this pair. Thank you for reading my review ! Oh my gosh: these look so sparkly and gorgeous on you! They really play off your pretty, dark hair. this is super pretty! makes your eyes look so sparkly!